Do you have a child with a sensory processing disorder? This book, I’ll Tell You Why..I Can’t Wear Those Clothes caught my eye a couple of weeks ago on social media after seeing a review of this thoughtful and beautiful book by Noreen O’Sullivan. To read my interview with Noreen, click here! I’ll Tell You Why..I Can’t Wear Those Clothes is written from the perspective of a child who struggles with the discomfort of tactile defensiveness during daily routines such as putting on clothing, socks and shoes. This book should be on every shelf of any child who struggles with sensory overload or defensiveness. It’s a wonderful book to share in a classroom to raise awareness of sensory sensitivities among our children. Included in the book are resources and a note to parents and teachers. As a speech language pathologist for almost 20 years, I have worked with children and adults with varying disabilities that have sensory integration disorders. Many of these individuals struggle every day being uncomfortable due to various routines that can be easily modified (e.g. taking tags out of clothes, providing sensory input). Often the individuals I work with have trouble communicating these difficulties. However, other children who are verbal, may not have the words to communicate tactile defensiveness because they don’t have the right words to describe it. This book is a perfect place to start! As you are reading this book, discuss the feelings of the little girl and use the questions on each page to help facilitate conversation. Discuss specific feelings and how they may relate to your child. How does your child relax? What does relaxing mean? Are you teacher? Try using post it notes on the workbook section of the book. This will help personalize the book for each student. I love how the author describes specific emotions related to the daily routines of dressing and getting ready for the day. What is tactile defensiveness and what are some key strategies that can help? 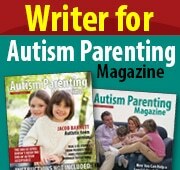 Check out this article in the Autism Parenting Magazine here for some helpful information. Learn more from this video below from Understood.